Anemia is a low level of healthy red blood cells (RBC). RBCs carry oxygen from the lungs to the rest of the body. When red blood cells are low the body does not get enough oxygen. 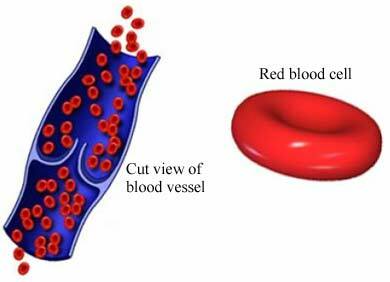 Liquid blood and plasma increases by about 50% during pregnancy but RBCs only increase by about 30%. This imbalance may lead to anemia. The most common cause of anemia in pregnancy is a low level of iron. Iron is the mineral that makes hemoglobin. During pregnancy, your iron requirements increase. If this need is not met or if your iron stores are low, you may develop anemia. Your practitioner will ask about your symptoms and medical history. A physical exam will be done. Your practitioner will test your blood for anemia at your first prenatal visit. It will also be tested again late in the second trimester or early in the third trimester. Other characteristics of your blood will be examined to look for any specific causes of your anemia. Your doctor may prescribe an iron supplement. Foods that are high in vitamin C, like oranges and other citrus fruits, will help your body absorb iron. Coffee, tea, milk, and calcium supplements can block absorption of iron. Avoid consuming these at the same time as your iron supplement. Iron supplements may cause constipation and/or nausea. If your iron supplement causes constipation, then try increasing your fluid and fiber intake. If your iron supplement causes an upset stomach, your practitioner may advise that you take it with food or may prescribe a different formula. If a folic acid or vitamin B12 deficiency is causing your anemia, your practitioner may prescribe a vitamin supplement. Take a prenatal vitamin containing iron, as prescribed by your practitioner, from the beginning of pregnancy. Eat foods that are high in iron including red meat, poultry, pork, shellfish, beans, iron-fortified breads and cereals, dried fruits, and leafy green vegetables. Eat foods that contain folic acid including whole grains, wheat germ, broccoli, beans, orange juice, and leafy green vegetables. ACOG Committee on Obstetrics. ACOG Practice Bulletin No. 78: hemoglobinopathies in pregnancy. Obstet Gynecol. 2007;109(1):229-237. Reaffirmed 2015. American College of Obstetricians and Gynecologists. ACOG Practice Bulletin No. 95: anemia in pregnancy. Obstet Gynecol. 2008;112(1):201-207. Reaffirmed 2015. American Dietetic Association. Nutrition and lifestyle for a healthy pregnancy outcome. J Am Diet Assoc. 2002;102:1470-1490. Anemia & pregnancy. American Society of Hematology website. Available at: http://www.hematology.org/Patients/Anemia/Pregnancy.aspx. Accessed April 7, 2017. Anemia and pregnancy. UCSF Medical Center website. Available at: https://www.ucsfhealth.org/education/anemia%5Fand%5Fpregnancy. Accessed April 7, 2017.